Financial Aid: For the 2018–2019 freshman class, 97.3% of those who applied for aid received need-based aid; 81.2% of those eligible for need-based assistance received Villanova Grants. More than $22.3 million was originally awarded in Villanova Grants, with an average grant award of $30,696. The average assistance package for students with demonstrated financial need (combining grants, scholarships, federal loans, and student employment) was $40,282. Founded in 1842 by the Order of St. Augustine, Villanova is the oldest and largest Catholic university in Pennsylvania. St. Augustine believed in a commitment to community and the connection between the heart and mind. These beliefs guide Villanova’s educational approach, making the Villanova experience not just about outstanding academics but each student’s growth as a whole person. Villanova—a picturesque 260-acre campus located 12 miles west of Philadelphia—is home to students of all faiths and tends to attract students who are dedicated to social responsibility and volunteerism. 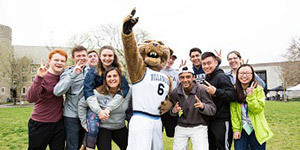 Villanova offers nearly 60 rigorous academic programs through four undergraduate colleges: the College of Liberal Arts and Sciences, the Villanova School of Business, the College of Engineering, and the M. Louise Fitzpatrick College of Nursing. Interdisciplinary concentrations are offered in a variety of areas, including Africana Studies, Arabic Language and Cultural Studies, Bioengineering, Business (through Villanova School of Business), Chinese Language and Cultural Studies, Cognitive Science, Counseling, Creative Writing, Ethics, Irish Studies, Japanese Language and Cultural Studies, Military Science, Naval Science, Peace and Justice, Public Service and Administration, Russian Area Studies, Russian Language and Cultural Studies, Statistics, Sustainability Studies, Theatre, and Writing and Rhetoric. 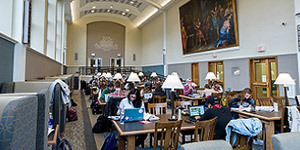 Full-time undergraduate enrollment at Villanova is approximately 6,500, while total University enrollment—including graduate programs, continuing and part-time studies, and the Villanova University Charles Widger School of Law—is nearly 11,000. At Villanova, you will find proven scholars, not graduate assistants, at the head of your classes. With an average class size of 22 and a 12:1 student-faculty ratio, you are ensured close interaction with your professors—more than 90% of whom hold the highest degree in their field. Incoming students with a strong record of academic achievement and cocurricular leadership are invited to apply to the Honors program upon their acceptance to the University. The Honors program is a comprehensive four-year program that offers seminars, research opportunities, service projects, and cultural and social events designed to bring together highly motivated, talented students with dedicated faculty. 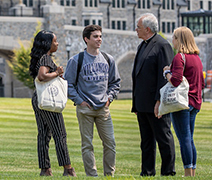 Villanova also offers a robust, competitive Presidential Scholarship program as it seeks to attract young leaders from diverse intellectual, social, racial, and economic backgrounds, including those from families in which few or no members have attended college. This renewable scholarship covers tuition, general fees, room, board, and the cost of textbooks for eight consecutive semesters. It is awarded to students for their demonstrated academic achievement and active participation in their schools and broader civic communities. In addition, first-year students are encouraged to join a themed Learning Community to live and learn among friends. Students in these communities live in the same residence halls, take the Augustine and Culture Seminar (a first-year requirement) together, and participate in tailored cocurricular programs such as lectures, plays, and trips. Villanova is a fun, close-knit, and caring community. There are more than 265 student organizations and 36 national honor societies—including chapters of Phi Beta Kappa and Phi Kappa Phi—at Villanova. Service to others through volunteerism and service learning projects is a fundamental part of the Villanova experience, and Villanovans provide more than 250,000 hours of community service each year. Semiannual service breaks enable students to choose projects of special personal significance (Habitat for Humanity is especially popular), and Villanova’s Special Olympics Fall Festival is the largest annual student-run Special Olympics event in the world. In addition, the annual Day of Service matches thousands of Villanova volunteers with service sites across greater Philadelphia. Housing is currently guaranteed for three consecutive years, and 66% of students live on campus. New suite-style residence halls opening in fall 2019 will allow 85% of undergraduates to live on campus in the future. When students are hungry for a meal or snack, Villanova’s award-winning Dining Services offers a wide variety of options with 18 eateries—three dining halls and 15 à-la-carte venues. Athletic opportunities for Villanova students abound. Nearly 20% of the student body participates in 24 varsity teams and 30 club sports, and each year approximately 3,200 students participate in 10 intramural sports. In 2016 and 2018, the men’s Division I basketball team won the NCAA National Championship. The University has also produced more than 60 Olympians in its history, and Villanovans have participated in every Summer Olympics since 1948. The Villanova Center for Multicultural Affairs provides a welcoming atmosphere for students and exemplifies the University mission of respecting individual differences and adhering to the principle that mutual love and respect should animate every aspect of University life. More than 37% of the senior class spent at least a summer abroad. Nearly 800 students studied in 34 different countries and 62 different cities all over the world. At Villanova, the Career Center and the Colleges collaborate to provide students with enriched course work and internship experiences. Innovative career and professional development concepts are integrated into the curriculum of all four Colleges starting as early as freshman year. Additionally, more than 19,500 job opportunities were posted on Villanova’s job boards; 96.3% of recent Villanova graduates became full-time employees or enrolled in graduate school within six months of graduation; and the average starting salary for Villanova graduates is $59,235.